It was bound to happen. Despite all of the talk about the demise of the travel industry during these tough economic times, a fascinating thing occurred: some cruise lines, airlines & hotels actually sold out their inventory for the summer season. Of course, the reason is obvious...prices dropped so low in the past few months that traveling almost became cheaper than staying home. And talk about getting more for your money. Since when did cruise lines start giving away free shore excursions, thousands of dollars to spend onboard & free flights (not to mentions, sail prices below what we've ever seen before)? Hotels too, coughed up free nights to sweeten the pot, and in many cases, were willing to throw in free meals or really, whatever it took, to put "heads in beds." But I am here to tell you, the days of the deep deep discounted deals industry-wide are all but over. The flood of daily deals to my inbox has slowed, and while many hotels are still offering terrific opportunities for travelers seeking great value for money, the near give-aways have nearly disappeared. What does this mean? Well, it means that those who took advantage of the early booking opportunities definitely got the travel deals of the decade. It also means good luck securing a spot on a Regent or Oceania Cruise this summer (both lines were nearly sold out at last check). But...it doesn't mean there aren't still some good deals to be had. Seabourn Cruises, for example, is having a one-week sale (book today through Friday for best prices). Crystal Cruises dropped select fares 25% last week (for 3 days only), and Silversea continues to promote 65% off certain sailings. And many hotels, while working hard to sustain competitive rates, are still willing to throw in some great value adds (note: we've become pros at securing these for our clients in this environment). But at the end of the day, here's what I believe: once a traveler, always a traveler. And being one myself, there are certain things in life you just can't sacrifice. 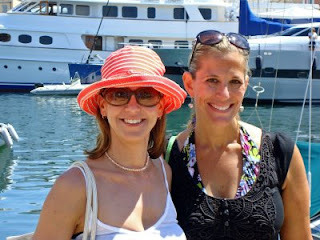 Luxury travel tops my list...and regardless of what "deals" are out there or who's offering free meals, I am always going to find a way to indulge my passion (as photo taken w/a gal pal on recent trip to St. Tropez illustrates!). Contact us today and we guarantee we can help you do the same. Suffice it to say, it likely won't be on a Regent Cruise to Alaska this summer, but we do have the inside scoop on incredible options available worldwide. Trust us, there are plenty of great options...and you'll certainly have a better shot of finding them with an expert--and fellow passionate traveler--on your side! For more details and a complimentary trip planning consultation, email EliteTravelGal@gmail.com or phone 310.979.9036.